After a fine trip to Red Rocks, I joined my family in Pismo Beach for a short vacation. I took the opportunity to visit a few landmark summits in nearby San Luis Obispo that I had missed on previous visits, taking only about three hours for the pair. 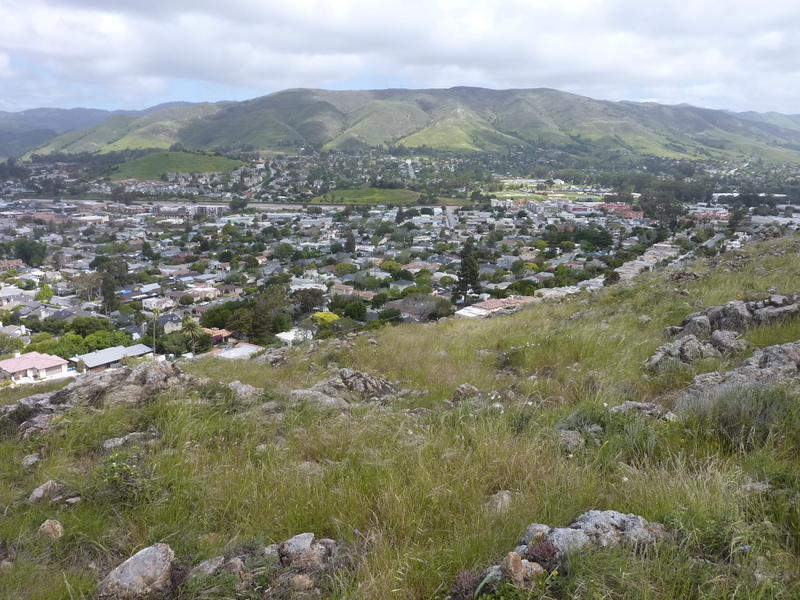 Located behind SLO High School on the eastern edge of town, this 4.5mi-long ridgeline stands almost apart from the Santa Lucia Range further east. Most of the slopes facing town are grass-covered or lightly cloaked in chaparral, while the NE side is more heavily sheathed in brush. The peak is also known as Lookout Hill and Murray Hill, all of which seem to be in common use. There is a fine trail on the NE side originating from Reservoir Canyon Rd off US101 and several trails starting up the SW side. I used the trail starting off Lizzie St, the High School Hill Trail, quite popular for cardio workouts by the locals. A bit eroded and rocky, the trail climbs steeply towards the NW end of the ridge, the highpoint another 3/4mi further SE once the ridgeline is gained. The views are open for almost the entire hike, save for the first quarter mile as it winds its way up more lushly vegetated slopes along a small creeklet. The highpoint features an impressively constructed rock seating area. Close inspection shows the hilltop rocks were chosen with great care to maximize their fit into the structure. On the way back I started down a second trail I found going down the SW side (desecending to Sydney St), but changed my mind after a short distance and decided instead to traverse cross-country over to the original route. I found an old mine prospect along the way but mostly just a bunch of stabby yucca that drew blood several times - ouch. This summit is the highpoint of the South Hills Regional Reserve, found on the south side of town about 2mi SW of High School Hill. The trails are both shorter and easier, almost trivial. The unusual name dates back to the 1920s when an auto racetrack was built at the base of the hill. The summit was the preferred viewing platform for those who didn't want to pay the price of a grandstand admission. The race track lasted only about three years, the hill now almost completely surrounded by suburbia, some of it very recent and still under construction. There are at least three THs that one can use to reach the highpoint. I used the one originating off Woodbridge St, about 3/4mi from the summit. This too, is a popular hiking area for the local populace.